As expected, Verizon Wireless has finally released the LG VX8600, becoming the first cell phone carrier in the U.S. to offer the phone. The LG Chocolate flip phone is intended for consumers who plan to listen to music on their phone and even features a MicroSD slot for extra storage. 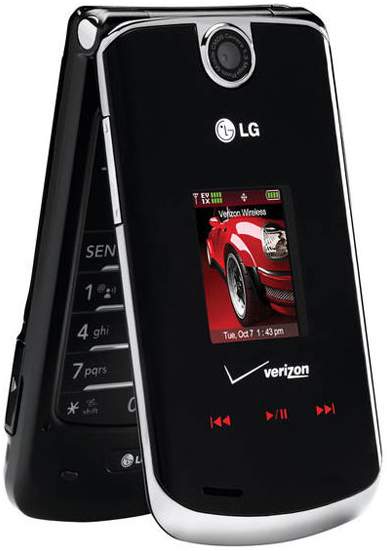 Although the phone may look like a rip off Motorola’s KRZR, LG had actually released the VX8600 overseas before Motorola even pushed out their phone. Anyways we hope LG has added something to make this phone better than the Moto KRZR, which we were quite disappointed with. MicroSD: store music, images, videos, etc. The phone will now be available in all Verizon Wireless stores and authorized retailers for a price of $129 with a new two-year contract and after a $50 mail-in-rebate. Current VZW customers, who are eligible for upgrade, can get an additional $100 off the phone, therefore costing only about $30 before adding taxes. We would recommend this phone over both the KRZR and the original Chocolate phones since it is cheaper than the KRZR, has more features, and has a standard flip phone form factor. KRZR is better at least i can sync with zyb.com more often, and have no fears as my data is saved. Choclate lot is more of fancy and less of utility. Help – I got the 8600 and love it… one problem that I can’t resolve is when I hook it up to my car MP3 plug (using an adapter cable) it only works in one speaker. Is is an issue with the phone or with the plug? Here’s your prob Paula. The jack is meant for a wired headseat (as opposed to the recommended wireless headset). Because it is intended for this, it only sends a mono signal (hence the one speaker. So either A) you have to splice the cord you are using and crossover the cables to make it mono in both speakers or B) get the Music Essentials kit which has the stereo headphones. Cut off the ear buds and put a stereo end on those. That will give you sound out of both speakers and will also play your calls through your car speakers. I Just got the phone about two weeks ago. it’s awesome, but when i transfer music, and Cd’s that i’ve ripped to my library won’t play on the phone. It gives me an error that says something about not being able to find the license. help? Before you tell others to learn how to spell, maybe you should learn how to add some punctuation to your sentences. Furthermore the word “your,” in the context you were using should be you’re. Sorry, I couldn’t resist. Is there anyway to transfer music from a mac computer or am I out of luck? It is very easy to transfer from a Macintosh system to this phone. Just insert the microSD into a card reader/writer and copy the MP3s right on over. You will however not be able to use an application for assistance. There are two ways of getting ringtones on this phone. First you can email the audio file to your 10DigitPhoneNumber@vzwpix.com. Second method is to connect it to your computer then install BitPim, which will allow creating ringtones for this phone. Also note that if you use the email method, you will be charged for messaging if you have no plan. I am having problems with this phone. Every time I try to sync and transfer mp3s from my computer to the memory card, the phone crashes and restarts. Then, the sync function ceases to work. I am able to format the card and get everything back to normal. However, my phone still crashes before I finish loading all my songs. Does anyone else have this problem or know a way to fix it? Is there any way to make music from the memory card as ringtones, without usng any kinds of messaging because my music files are too big to send them….? would you get the EN-V , Samsung u740 or the LG 8600? With the u740 and enV available, I would not go for the VX8600 since it is now the oldest of the three. The enV is a bit bulkier, but has a large QWERTY keyboard and 2 megapixel camera. The u740 is even newer, but it only has a 1.3 megapixel camera and the keyboard is a bit more difficult to use. Other than that both phones have mostly the same features. The u740 in my opinion is to fragile since it has two hinges to twist the phone in multiple directions. I would probably break it before my 2 year contract is over. Therefore I would go for the VX9900 (enV). my friend has then enV and i dont like it. i just got the 8600 and so far i like this phone better than the enV. to me the enV is just to bulky and unless you text or get online alot there really is no need for the inside with a keyboard like that. but i guess thats just my opinion. i just got the LG VX8600. it is a really nice phone, but im having trouble finding how to use the speakerphone on it. can you help? Katie, to enable the speakerphone just press and hold the voice command key during a call. Click Here for an image of the button. i want to take a picture of myself on my new phone. When i take a picture i want flip the phone down like the razor and take the picture. except on the LG it doesn’t want to do it. why can’t i take a picture with it flipped down? I guarantee you should be able to. When the phone is closed. Press and hold the Camera button for a second or two. The camera should start up. If it still doesn’t let me know. Click Here for an image of the button. i am having issues with the phone i am now on my 2nd one, for some reason it will just turn off real quick when it gets down to low batt. no noise or anything it will just shut off. My phone does the same thing. There ıs almost no warning between when it says the battery is dead and when it turns off on yah.